My 5: Super Potato Retro Video Games – Akihabara, Tokyo. 1. February 2019. What an afternoon I’d had wandering aimlessly around the amazing fanboy stores of Tokyo’s Akihabara Electric Town! I’d bought T-shirts at Don Quijote, climbed all eight floors of the Mandarake Complex and dipped in and out of countless anime, manga and Otaku stores in between. Now, with evening rapidly closing in and a hungry stomach that soon needed feeding, it was time to cross off another essential Akihabara landmark. 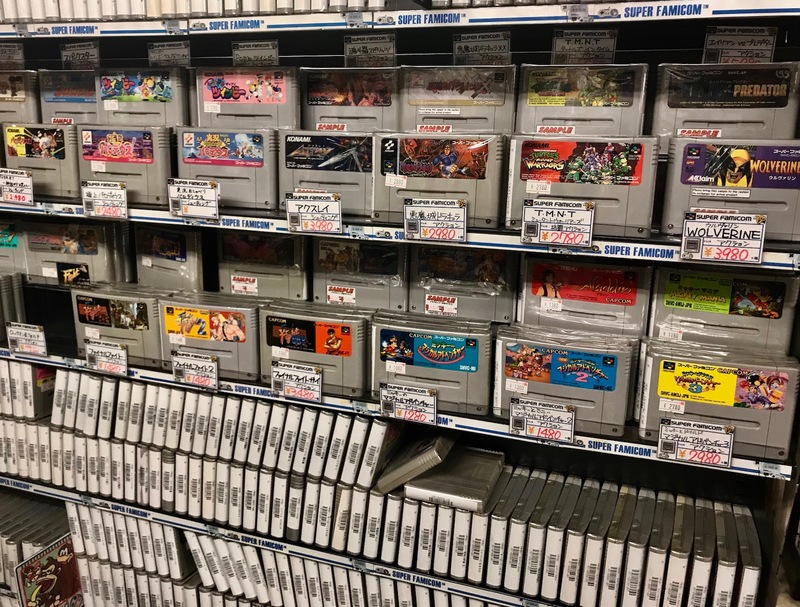 As someone who’s old enough to have owned both a ZX Spectrum and a Gameboy back when they were the hottest technology going, I couldn’t miss out on a visit to the amazing Super Potato, Japan’s most kickass retro video game store. 2. February 2019. Spread out across the third, fourth and fifth floors of a ramshackle building near Akihabara Station, the moment I entered it was like being transported back to my childhood. Check out the old game stations connected up to ancient TVs and drink in the cheesy keyboard-heavy, 80s theme music that punctuates the airwaves. You could spend hours in here picking out all the tiny details, from Super Mario dolls and Pac-Man stickers to Donkey Kong key rings, trays of grubby old used game cartridges, Sonic the Hedgehog posters and Pokémon T-shirts. 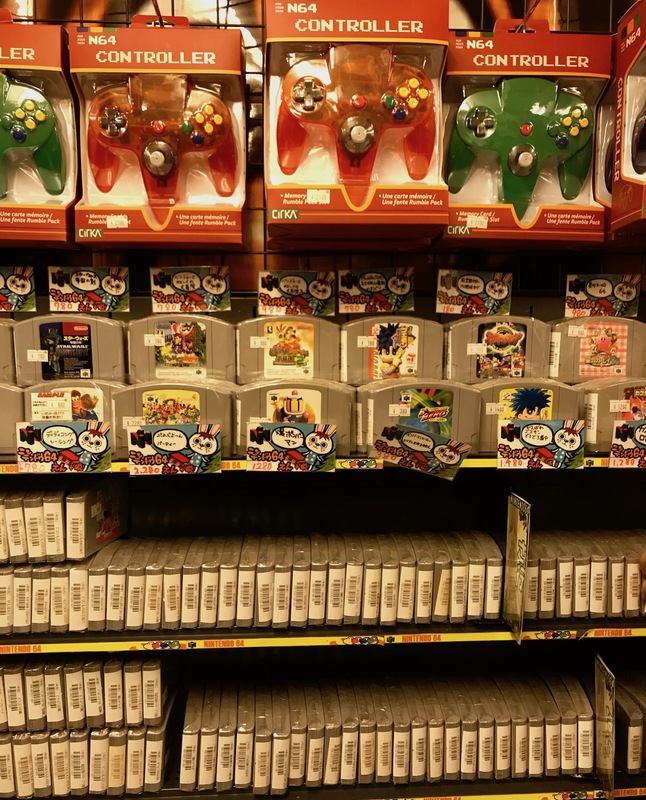 N64 games and controllers – Super Potato, Tokyo. 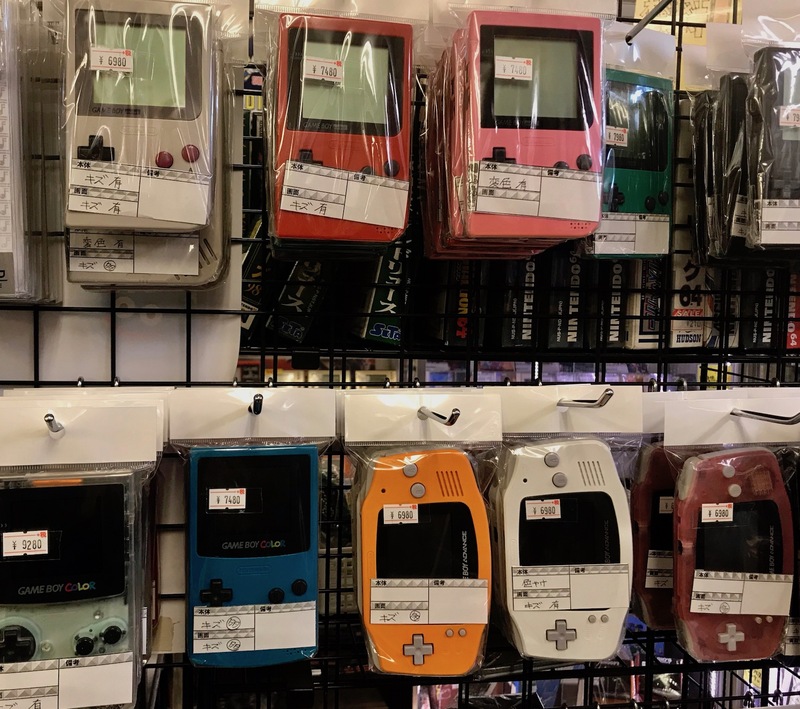 Gameboys galore – Super Potato, Tokyo. 3. February 2019. Super Potato has a vast range of old and new games on offer, some of which can only be bought at this store. I spent a fair bit of time leafing through all the Nintendo stuff, particularly classic N64 and Game Boy releases like Tetris, Pokemon, Super Mario and Kirby’s Dream Land. They also have a full range of Game Boys on sale, from the original standard version I had as a kid priced at 6980JPY (£47/€55/$62) to the Game Boy Color and Advance formats that came later. 4. They also had a large section on Super Famicom, a game system I’d admittedly never heard of. But then, on closer inspection I realized it was simply the Japanese name for SNES/Super NES (Super Nintendo Entertainment System). 5. February 2019. 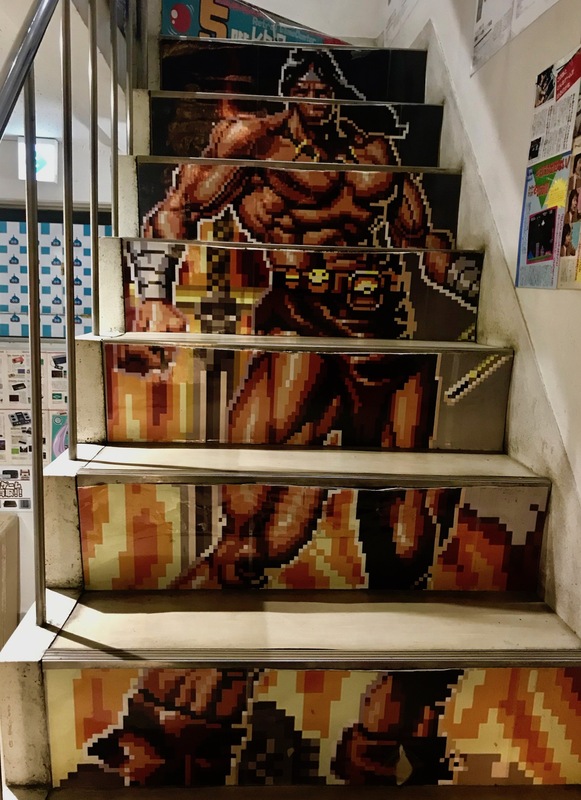 Take the short staircase up to the 5th floor where there’s a small vintage arcade and snack shop. Just roll up, grab a bottle of pop and throw some coins into the game of your choice. Be careful, before you know what’s happened you’ll have been here for hours. If retro video games is your thing then Super Potato is pretty much heaven on earth. For me, a more casual video game fan, it was cool to simply reconnect with some old friends from my childhood and soak up the retro vibe while ticking off what was basically another very authentic Tokyo experience. Super Potato Akihabara is located in the Kitabayashi Building, just 250 meters from Akihabara Station. It opens daily from 11:00-20:00 on weekdays, 10:00-20:00 on weekends. My 5: The Mandarake Complex – Akihabara, Tokyo. Yeah, this place is legendary, you can seriously spend all day browsing and playing the games. 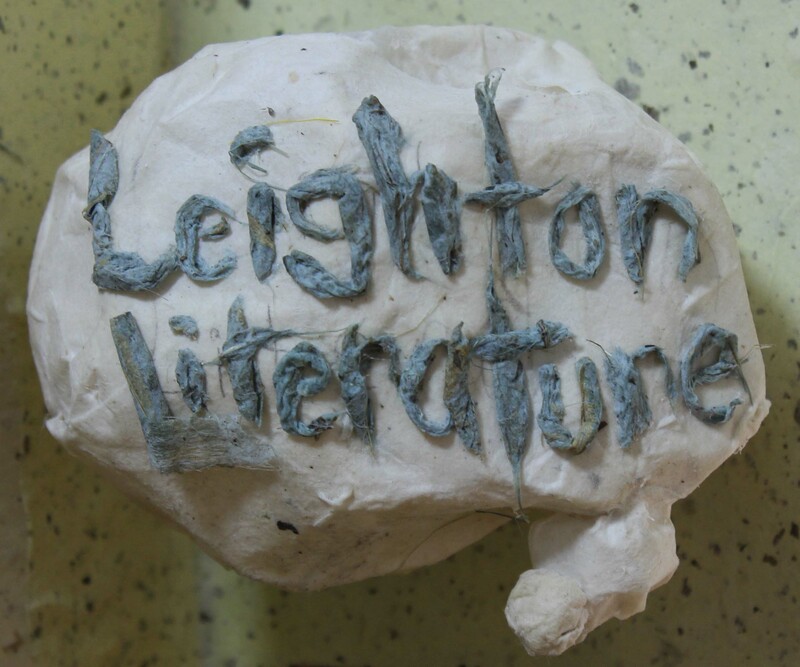 Hey Ben, thanks for stopping by Leighton Literature and taking the time to comment! Super Potato was indeed really cool and a must see for any video game enthusiast.